Las Vegas to Los Angeles bus tours and shuttles will take you to Hollywood, Beverley Hills and Santa Monica for a quick break, a day trip or to catch a plane. There are a few options available - bus transfers and even organized LA sightseeing tours, although not as many as one would hope. After all, the distance from Vegas to LA is 270 miles (434 km), and it takes about 4-5 hours to get there. Below are a few tours that are available for the same-day travel as well as multi-day tours from Vegas. If you are looking for a relaxing yet fun filled Las Vegas to Los Angeles bus tour, then look no further. You will travel by VIP coach from Las Vegas enjoying the iconic high desert of Nevada. You will travel on style and enjoy a continental breakfast while you voyage through Death Valley, view ancient Joshua Tree forests and absorb the natural scenery before entering Los Angeles. Once in Los Angeles you will have plenty of time to shoot photographs of the Hollywood Sign, Hollywood Boulevard's Walk of Fame as well as the Sunset Boulevard, Magic Castle and Walt Disney Studios. Enjoy your ride home and listen to the many fascinating questions that our expert tour guides answer for fellow tour goers. 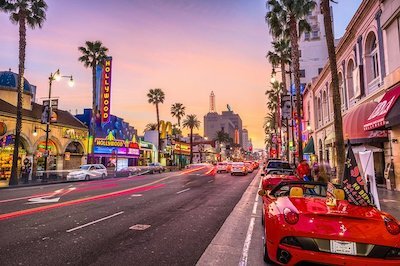 Act like a Hollywood star for the day on this excellent Las Vegas to Los Angeles bus tour that will take you to not only Hollywood but Beverly Hills and Santa Monica. This 14-hour tour starts with an early morning pick up at your hotel and then you will travel by VIP coach to Hollywood, where after a photo opportunity with the iconic Hollywood sign, you will visit such famed places as TCL Chinese Theater, Rodeo Drive, Hollywood Walk of Fame and Sunset Boulevard. You will have plenty of time to search and take photographs of all the stars you encounter. As you depart Hollywood you will travel to the Santa Monica Pier, where you will enjoy a complimentary lunch and after you can frolic in the Pacific Ocean. Relax in the spacious VIP coach on the way home and dream of all the stars you viewed on this excellent adventure to Hollywood. Also included in your memorable Hollywood excursion is a unique embroidered souvenir Hollywood cap. 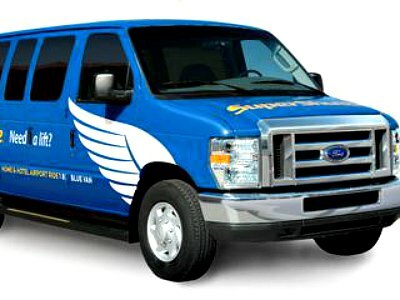 This is a comfortable, luxurious shuttle that runs from Las Vegas to Los Angeles and back. It's perfect for those who plan to hang out in LA for a day or two before going back to Vegas. The shuttle departs from Harrah's and The California Hotel and Casino in Vegas, and drops off at multiple hotels in Los Angeles. Many claim that this comfortable coach is so much better than flying! The shuttle offers all the comforts from reclining seats to complimentar snacks (albite not unlimited), plus 2 movies are shown during the trip. This cheap Las Vegas to Los Angeles bus transfer starting at $35 per person is suitable for those who want to enjoy Los Angeles on their own. You will be picked up at 8:40 am from Circus Circus Skyrise Tower. Several drop off locations near LA are available, including Chinatown Senior Citizen Center in Los Angeles. Start your mid-morning in Las Vegas off with an exquisite American style brunch before you set-off on your tour of Los Angeles. You will enjoy a comfortable ride within a climate controlled coach that will allow you to sit back and enjoy the sights of the Mojave Desert as you travel westward to Los Angeles. The bus will make a 1,5 stop at Tanger outlet where you will be able to do some shopping. Las Vegas to Los Angeles bus transfer is a wonderful way to do some unique sightseeing while on vacation in Las Vegas. Children 2 and younger are free but must not occupy a seat during travel. In addition there is an additional service of $7 that will be paid to the driver of the bus. If you are travelling with a small group of up to 7 people, then this exclusive tour with a personal guide is for you! This Las Vegas to Los Angeles and Hollywood Day Tour will get you into the exciting movie star vibe. Set off early from your Las Vegas Strip Hotel in an air-conditioned bus with leather seats. You will enjoy a light breakfast on route as you travel through the scenic Mojave Desert and learn all about this famous region from your knowledgeable guide. When you arrive in Los Angeles you head straight to the action! Visit the Santa Monica Pier, a landmark that is over 100 years old. See the solar-panelled Ferris Wheel and the original 1920 carousel hippodrome. Soak up the vibe of the shops, pubs, restaurants and arcades. At the end of the famous Route 66, you can dip your feet into the Pacific Ocean and snap a selfie. Next you are off to see how the rich and famous live in Beverly Hills as your bus winds past the luxuriously decked out mansions. Keep your eyes open – you may spot a celeb hiding behind large designer shades. 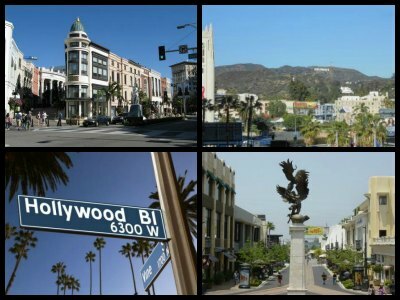 Then savour your ride down Rodeo Drive, the heart of fashion, luxury, designer stores and famous landmarks. Look out for the Beverly Wilshire Hotel, made famous in the movie Pretty Woman. Take in the razzle and dazzle of Hollywood Boulevard. Feel nostalgic on Sunset Boulevard, a place where world famous bands started their careers. Your next stop is Santa Monica Boulevard and then it is off to see the iconic Hollywood Walk of Fame, the world-famous sidewalk of stars! Snap some photos of the Hollywood Sign and admire the stunning evening views over Los Angeles. As your Las Vegas To Los Angeles tour ends, settle back into your bus and chat about all you have seen on your way back to Vegas. Create memories to last a lifetime when you join our Las Vegas to Los Angeles, Grand Canyon, Antelope Canyon, Los San Francisco 7 Day Tour. You will explore glitzy cities, see stunning landscapes and meet fabulous people. Day 1 is the meeting point in Las Vegas, also known as Sin City! Spend the day exploring shops, eateries and casinos. You can also join a night tour or attend one of the many world-class stage shows. Day 2 offers a choice of 3 stunning natural venues which you will select when booking your trip. Option 1 of this Las Vegas to Los Angeles tour visits the West Rim of the awe-inspiring Grand Canyon. On route you will stop at the massive Hoover Dam and see Lake Mead, the largest artificial lake in the USA. You then continue to the Grand Canyon, one of the Seven Wonders of the World. This surreal landscape has been formed over eons of erosion by wind, water and sun, creating amazing sculptures and rock formations. You can take an optional non-included helicopter ride or a trip on a cruise boat down the Colorado River. If you have a head for heights, try out the Skywalk, a glass bridge suspended on the very edge of the Canyon! Option 2 of this Las Vegas to Los Angeles tour visits the South Rim of the Grand Canyon. On route you will stop at the massive Hoover Dam and see Lake Mead, the largest artificial lake in the USA. You then continue to the Grand Canyon, one of the Seven Wonders of the World. This dramatic landscape has been carved out of the limestone over millions of years of erosion by wind and water. You will view the amazing sights from Mather Point, near to the Visitor’s Center. Make sure you snap some pictures to post on social media! Option 3 travels to Antelope Canyon and Horseshoe Bend. See the magnificent slot canyon with surreal light effects as the sun filters down into the corridors between the rock formations. Then view the huge greeny-blue U-shape of the Colorado River as it makes a turn around massive rocky cliffs. All 3 options return to Las Vegas for more night-time fun. Day 3 will delight chocolate lovers. Set off to the famous Ethel M Chocolate Factory where you will learn how chocolate is made and sample some delectable treats. Then relax at the Botanical Cactus Gardens and take a leisurely walk along the garden trails. After a buffet brunch, your bus departs for Los Angeles, stopping at the famous Tanger Outlet Center where you will be able to make good use your plastic cards. Day 4 offers a choice of 3 itineraries. Itinerary 1 drives to Santa Barbara, America’s Riviera! Enjoy the stunning scenes of the Pacific coastline on the way. Visit Solvang, a cozy town with a Danish influence. Then head to the techno-capital of the world - Silicon Valley. See how the computer whiz-kids live in lavish houses. This area has the highest concentration of millionaires and billionaires in America. Itinerary 2 operates prior to October 15, 2018. Your trip drives to Santa Barbara, America’s Riviera! Enjoy the stunning views Pacific coastline dotted with Mediterranean and Spanish style homes. 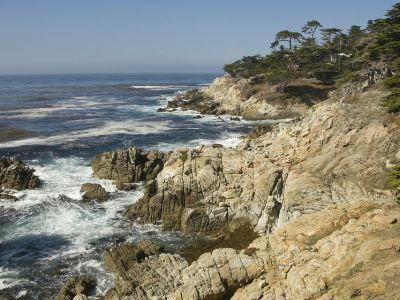 Then head to the picture-perfect Monterey Peninsula to soak up the natural scenery surging waves and wonderful sculpted rocks. Look out for seals and sea lions basking on the beach. See a world class golf-course and then view the breathtaking scenery of the 17-Mile Drive. Itinerary 3 operates after October 15, 2018. Drive through the stunning Agricultural Central Valley of California, a massive region that produces fruit, nuts and vegetables. Stop to admire the magnificent natural scenery of the Montery Peninsula, a meandering coastline, crashing waves and beautifully sculpted rocks. Snap some photos of the seals and sea lions basking on the beach. See a world class golf-course resort with multimillion-dollar mansions and view the breathtaking scenery of the 17-Mile Drive. On Day 5 the morning starts with a drive to campus of UC Berkeley, a world-class educational venue, creating 72 Nobel Prize winners! Continue to San Francisco, a magnificent city set amongst rolling hills and surrounded by water on three sides. Visit Lombard Street, the Golden Gate Bridge, Palace of Fine Arts and Fisherman's Wharf. Take an own-expense cruise on the San Francisco Bay and have great fun with your favourite celebs created in a wax at Madame Tussaud. Day 6 offers to visit the awe-inspiring Yosemite National Park. See the massive trees, mountains, sparkling streams, placid lakes and glacier-carved canyons that make up this natural wonderland. Take a walk and get close to these beautiful sights. After lunch, travel across the famous Agricultural Central Valley of California. Look out for the massive plantations growing fruits, nuts, and vegetables. The tour returns to Los Angeles. Day 7 offers a choice of 9 options – choose the one that delights the most! Option1 – Disneyland / California Adventure Park with no tour guide. Great for children. Visit this magical kingdom where you can explore exotic jungles, sail with pirates and meet fairytale princesses! Option 2 - Disney's California Adventure Park. Be thrilled and get an adrenaline rush on the California Screamin', the Twilight Zone Tower or Terror and the Grizzly River Run. Option 3 is for movie lovers. Visit the Universal Studios Hollywood and see a working movie studio. Enjoy the theme-park rides, do some shopping and eating at the world famous CityWalk. Option 4 of this Las Vegas to Los Angeles tour takes you to SeaWorld San Diego. Enjoy thrilling rides with names like Journey to Atlantis and Shipwreck Rapids. See a massive aquarium, home to 60 threatened sea turtles. Kids can learn all about our sea-friends with fun interactive games. Option 5 is a San Diego Tour. Visit Downtown San Diego and enjoy a leisurely cruise to see the city and San Diego Bay. Then board the USS Midway Museum to be awed by its navel-themed exhibits and aircraft. Option 6 is a Los Angeles City Tour. 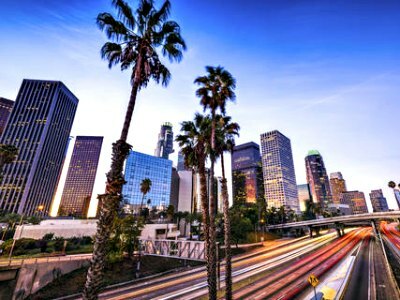 Known as the City of Angels, Los Angeles delights with areas like sunny Santa Monica, lavish Beverly Hills and the famous Rodeo Drive. Option 7 is for the shoppers! Visit Palm Springs where you stop at the largest factory outlet center - Desert Hills Premium Outlets. Get your retail therapy in more than 110 global name brand retailers. You will have 6 uninterrupted hours for shopping and lunch! Option 8 visits the Aquarium of the Pacific which features over 12000 marine species. Then board a boat for a mind-blowing 2.5 hour whale watching cruise. After the cruise, visit the famous Battleship Iowa. Option 9 is for adults and kids! Visit the incredible LEGOLAND, a 128-acre attraction filled with every type of Lego construction imaginable. There are also rides, attractions, games, shops and restaurants. Perfect for children and for adults who are young-at-heart. Our next recommended tour is the Las Vegas to Los Angeles, Grand Canyon, San Francisco and 17-Mile Scenic Drive 8 Day tour. A fabulous lifetime experience that starts in Las Vegas, travels to Los Angeles and ends in San Francisco – three iconic American cities! Day 1 offers time to explore Sin City. See the lavish casinos, walk along the famous Las Vegas Strip, soak up the glitz and glam and enjoy a world famous stage show. Day 2 offers a choice of 2 itineraries. Itinerary 1 sets off to the breathtaking Grand Canyon National Park, a World Heritage Site. You will see panoramic views of the Grand Canyon South from the rim and can also watch a Grand Canyon IMAX film, not included in the cost. Itinerary 2 sets off to the West Rim of the Grand Canyon. You will pass by the massive Hoover Dam and then travel through the majestic Hualapai Native American Reservation. Enjoy a Chinese style lunch and take a walk along the Rim to see astounding views of this surreal landscape. If you have a head for heights, enjoy a helicopter trip or walk along the massive glass Skywalk, hanging out high over the Canyon Floor! You can also optionally take a cruise in a pontoon boat along the mighty Colorado River. Day 3 sets off to Los Angeles. Visit the iconic landmarks of Hollywood, Hollywood Boulevard and the Chinese Theater. See the famous Dolby Theater complex, home to the Oscar Award Ceremony and then visit the Walt Disney Concert Hall. Day 4 offers a choice of 2 itineraries. Itinerary 1 is fun for the whole family with a trip to Disneyland, Anaheim. Meet all your favourite characters, see interactive displays, explore castles and pirate ships. This stunning theme-park will delight kids and adults alike. Itinerary 2 offers a San Diego City Tour. Enjoy a drive along the beautiful Pacific coastline. Your first stop is the U.S. Naval compound in San Diego Harbor where you will see the USS Midway, the longest-serving aircraft carrier in U.S. Naval history. After lunch, your tour visits Coronado Island and the Hotel del Coronado. This world-famous luxury hotel is a National Historic Landmark, built in the 1800's Victorian style. Then relax in the magnificent Balboa Park, filled with lush botanical gardens. Soak up the vibe in Old Town San Diego, see classic Mexican Pueblos and shops selling Latin American handicrafts. 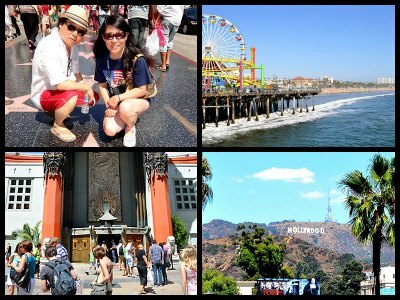 Day 5 of this Las Vegas to Los Angeles tour offers a choice of 2 itineraries. Itinerary 1 is for movie lovers! Set off to the mind-blowing Universal Studios, a haven of all things silver-screen. See the Jurassic Park and Shrek attractions, admire world famous movie memorabilia, visit a working movie set. Learn behind-the-scenes secrets of legendary films on an exclusive studio tour. Itinerary 2 offers a tour of Los Angeles. Start off by visiting sunny Santa Monica, a famous venue featured in many movies. Explore Rodeo Drive in Beverly Hills made famous in the movie Pretty Woman. After lunch, head downtown to see breathtaking city views from the top of the US Bank tower. Thrill-seekers can ride the Sky Slide, a transparent glass slide 1000 feet in the air. Continue to the Los Angles Memorial Stadium, and see the Angel Flight Railway. Day 6 heads to San Francisco stopping at the Tejon Ranch, famous for its world-class retailers. Do some shopping and buy gifts for loved ones back home. Day 7 – the fun continues! Today you are off to experience the beauty of the California coastline, driving along the scenic 17-Mile Drive. Be wowed by views of Seal Rock, Cypress Point and Pebble Beach. Your trip stops in the enchanting Carmel-by-the-Sea, where you can browse quaint shops and art galleries. Then it is off to Monterey for some sightseeing and a visit to Monterey Bay Aquarium. Day 8 of this Las Vegas to Los Angeles tour is spent exploring San Francisco. This bustling, diverse city will delight you. See the Twin Peaks, Golden Gate Park, Golden Gate Bridge, Fisherman's Wharf, Market Street, Chinatown and more. The tour ends at San Francisco International Airport where you can say your goodbyes to newly made friends and exchange contact details. See the best that the West Coast of America has to offer on this fabulous tour. Travel in a luxurious bus with a professional guide and enjoy our Las Vegas to Los Angeles, Grand Canyon, Universal Studios and San Francisco 7 Day Tour that you will never forget! Day 1 – meet your tour guide early and get to know your fellow travellers. Then set off to ride the Eiffel Tower replica in Las Vegas. See the city sights from a glass elevator high up in the sky. Explore the Las Vegas strip, do some shopping and soak up the glitzy vibe. Day 2 allows free time to explore more of Sin City or you can join a Grand Canyon Tour at your cost. If you choose to explore, you will be enjoy breakfast at the famous St. Louis Café Restaurant. You will then ride around the city in a double-decker bus while your guide keeps you entertained with stories about this glamorous city. See the dazzling neon lights, pass the iconic casinos, wedding chapels and historic landmarks into the heart of Downtown. If you have chosen the Grand Canyon Tour, you will be provided with a packed breakfast to take along. Day 3 of this Las Vegas to Los Angeles tour sets off to Los Angeles with a stop for lunch on the way. Visit the OUE Skyspace and be awed by 360 degree views of the city. If you are brave take a ride down the Tower's world famous slide. Then set off on a guided tour to see the Avenue of Stars and Rodeo Drive. Make sure you snap a photo of the iconic Hollywood sign. Day 4 will delight movie fans. 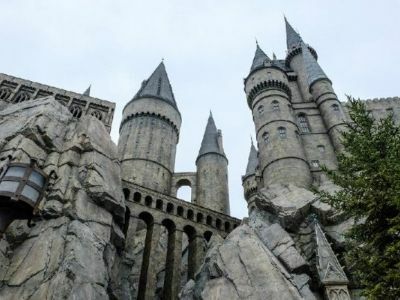 Spend time at the famous Universal Studios. See a working film set, hear insider stories of famous celebrities, try out some adrenaline-pumping rides, eat and shop up a storm. A unique and fun day for the whole family! Then continue to the sunny Santa Monica Beach and enjoy some relaxed time at the Pier. The fun continues at the carousel, the arcade, amusement park and restaurants. Day 5 of this Las Vegas to Los Angeles tour takes you on a fascinating drive to Solvang, a city with Danish roots. It offers untamed beauty and stunning weather all year round. Learn all about Solvang on a 25 minute ride through the city on a Horse Trolley. Get settled back on your bus for a 4 hour drive to San Francisco. Day 6 offers a full day to explore San Francisco. See the mind-blowing skyline from the Bay while on a cruise. 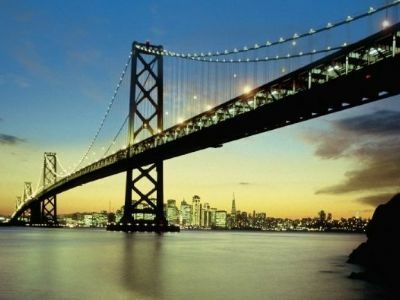 Enjoy the spectacular views of Alcatraz, the Golden Gate bridge and Bay Bridge. An Audio Tour will give you detailed information about this great city. After lunch, you will visit Twin Peaks, the two prominent 900 feet tall hills near the center of the city. Add to the fun with a ride on the famous Cable Car. It is the world’s last manually operated cable car system. End your day watching a thrilling 3D movie that has you gasping as you fly over the city! Day 7 of this Las Vegas to Los Angeles tour sees the end of a memorable occasion. Say your goodbyes, exchange contact phone numbers and set off home filled with amazing memories.